No Ordinary Love might not excel in lyricism, but it makes up for this with innovative music, heart, and well placed guest appearances. Rawsrvnt (pronounced: Raw Servant) may be an average emcee but he is an incredible artist. The songs on this album have so many instrumental and vocal parts that you might forget you are listening to a hip hop artist. There are no simple loop based beats here, instead you find very complex, well thought out music, complete with electric guitars and background vocals. These elements are all used greatly and go a long way in making up for the average rhymes. The title track No Ordinary Love is a solid remake of the Sades song of the same name. Here you find Rawsrvnt laying his soul bare for listeners as he reflects on the beauty of God, redemption, and his own role in the crucifixion of Christ. These verses are complimented by the amazing voice of songstress Lisa McClendon whose presence really takes this track to the next level. Rawsrvnt should definitely be commended for pursuing the royalty rights to remake this iconic and Grammy award winning song. Somehow it seems No Ordinary Love was always meant to be a love song, sung to God, and as the opening song it sets a great tone for the album. Rawsrvnt describes his music as “Hip Hop Worship” and it’s easy to see why. The songs on this album intentionally create an atmosphere for hearts to encounter God. A good example of this is Holiness and Here I Am to Worship, which are his Hip Hop interpretations of the two popular Contemporary Christian songs. Not only are these songs done well, but they might actually connect with listeners even more than the original versions. These are only two of several tracks on this album which might get more play in your quiet time than in your gym time, something that is not typically stated of a rap album. 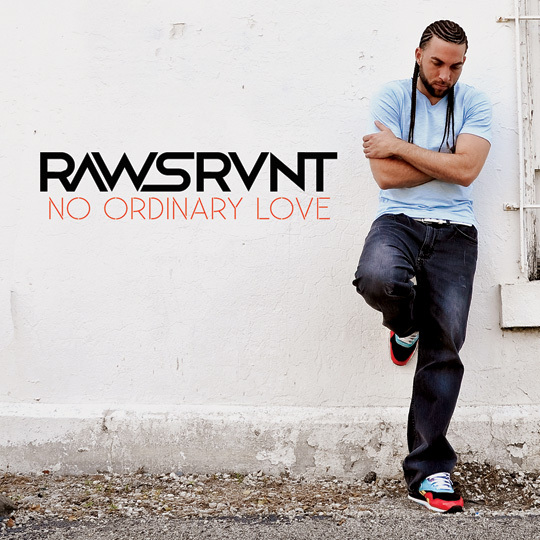 Where No Ordinary Love excels it does so because of Rawsrvnts distinct voice (both rapping and singing), solid flow, and memorable hooks. It also doesnt hurt that he enlisted the assistance of New York emcee Sean Slaughter on the songs Be With You and Bow Down. With his usual brash rhyme style Slaughter offers two excellent verses contributing much needed lyricism and wit to this project. Ring That is the only truly disappointing song found on the album. The bland chorus urges cell phone users Jesus is my Savior ring that on ya cell phone! Encouragement to be bold about your faith is always greatly appreciated; songs made after 2008 making mention of ringtones, however, is not. With all this said, the most impressive thing about this album is surprisingly not the music. In “On Fire” Rawsrvnt says “my passion goes deeper than rap / it goes deeper than the kick drum and the hi-hats.” More than almost any artist I have heard over the last few months I can tell this is true of him. This authentic and transparent love is not only encouraging to see, but is also a great reminder that we are called to love God, not just facts about Him. With his fifth studio album Rawsrvnt does a great job of urging believers to fall more in love with the Creator of the universe. He does this without making use of elaborate rhyme schemes or complex metaphors, and maybe thats why the message comes through so loud and clear.